Angus Fire Hi-Combat Turbex High Expansion Foam generators are designed to produce large capacities of high expansion foam, up to 200 cubic metres (7,000 cu.ft) per minute for fast and effective flooding of large and inaccessible spaces with minimal water consumption and subsequently minimal water damage. 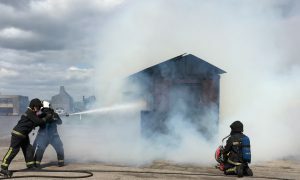 The unit is also capable of rapid smoke extraction(SX), positive pressure ventilation and removal of foam once the fire is extinguished. Hi-Combat Turbex generators are ideally suited to a wide range of applications. These typically include filling enclosed areas with foam where carbonaceous materials and flammable liquids may be stored, such as basements, cellars, tunnels, roof voids, cable ducts, warehouses and mines. Large quantities of smoke can be extracted at the rate of 285 cubic metres (10,000 cu.ft) per minute by the Turbex Mk II at 7 bar g. inlet pressure with the special smoke extraction ducting. This facility can also be used for the removal of foam bubbles once the incident is over. Each Hi-Combat Turbex utilises forced air technology and is powered by an enclosed maintenance free water turbine driving an aerofoil fan, so that only a pressurised water supply is required for operation with Angus Expandol High Expansion Foam concentrate, consumed at typically 4.5litres/min. A special in-built filter system protects the turbine and inductor from blockage due to solid particles in the water supply.